We end this week of reviews with a review of the retro variety: Wario Land II. It originally released on the Game Boy in 1998 before receiving an enhanced color version on the Game Boy Color the following year. How does it compare to Super Mario Land 3? Let's find out. There are a wonderful amount of Game Boy and Game Boy Color titles that have yet to make it to the Nintendo 3DS's Virtual Console service. However, instead of moaning about what isn't there, I'd rather be happy about what is there. One such worthy title is Wario Land II, Wario's first full platforming adventure without any ties to his rival Mario (i.e. no "Super Mario Land" in the title). It's a game that proves that Wario can do just fine on his own without Mario's star power to help. When a series of Captain Syrup's goons pillage a sleeping Wario's goods and treasures, the yellow and purple clad plumber finds himself pursuing through forests, oceans, ruins, and castles. Don't these fools know that stealing is Wario's job? 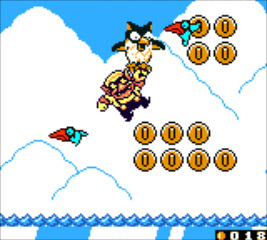 Wario Land II is quite different in both structure and gameplay than its predecessor, Super Mario Land 3. The traditional power-up system has been replaced. In Wario Land II, Wario can get hit as many times as he wants and never dies. There are no lives in the game. Instead, Wario collects coins, and each time he takes damage, he loses some from his total. The challenge of the game comes from obstacles that get in one's way as well as puzzles. You might wonder how bosses work in Wario Land II, then if Wario cannot die. You see, bosses in the game try to knock Wario out of the battle arena somehow. 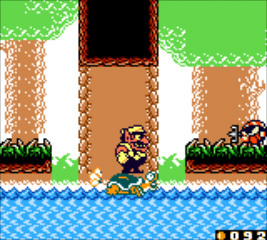 For instance, a bee boss tries to sting Wario so his head inflates and causes him to float out of the arena, forcing the player to start the encounter anew. As stated, gone are the power-ups from yore. Replacing them are different forms of Wario. I mentioned one of them when Wario gets stung by a bee. 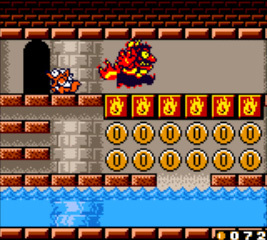 Another happens when a fire enemy breathes its hot flame on Wario, making him do a mad dash across the level, allowing him to burn up certain blocks after this process. In each level there is a treasure to collect, collected from winning a mini-game. Unfortunately the door to the mini-game looks the same as every other door in the game, but usually you can tell as the door is hidden away in a secluded and/or hard-to-find spot. The mini-game that you play has eight tiles in two rows and four columns. The lock on the treasure shows a specific enemy. When the countdown chimes to zero, the eight tiles will turn over, revealing the enemy portraits they hold, before quickly flipping back. Depending on how many coins you spend, the tiles will reveal themselves for a short or longer period of time. Choosing the tile that has the same face as the lock on the treasure chest will net you that treasure. Collecting coins are important not only for that mini-game, but also for the end of level mini-game. There is a 3 x 3 spread of tiles. The entire spread is hiding a number from 0-9. As the tiles turn over, you spend coins in increments of fifty. Guess what number the tiles are hiding, and you win a piece of the map. Beating the game and seeing the "ending" are just one part of Wario Land II. Once Captain Syrup has been initially defeated and the credits have rolled, you can visit past levels. You will notice on the level select screen that there are sometimes two exits in a given level: one easy to find and one secret. 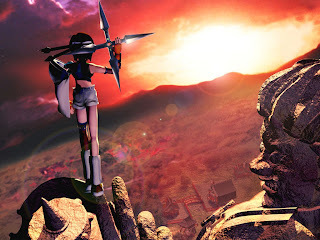 In order to get 100% of the game completed, you must beat every level, find every treasure, and collect every map part. That is no quick task as there are tons of levels in Wario Land II. 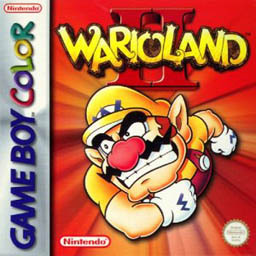 Compared to Super Mario Land 3, Wario Land II boasts an exponential amount of playtime. The controls of Wario Land II have that Nintendo-quality tightness that fans and players alike have grown to expect from the company. Wario has an assortment of attacks to assist him through his adventure such as the ability to charge (great for plowing through weak walls), to chuck enemies, and to ground pound. Complaining about the controls of Wario Land II is something I never did for the 10+ hours it took me to do everything in the game. 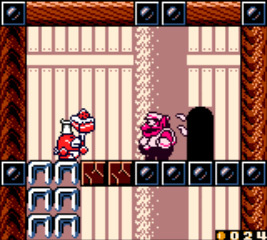 The game was originally developed for the Game Boy and was the last first-party developed title for that platform. A color-enhanced version (the one that this review is based on) was released a year later. The game sports big sprites and objects that are easy to see, so running into something that blends into the background is something that doesn't usually happen. The music is appropriately jaunty in most cases, subdued in others. All-in-all, Wario Land II looks and plays in a fine fashion. Comparing Wario Land: Super Mario Land 3 to Wario Land II is something that can be done, but it doesn't do either game justice. They are different experiences, albeit sharing the same platforming at their cores. Both are terrific Game Boy-era platformers that still hold up well in this day and age. While Super Mario Land 3 is a more traditional platformer, Wario Land II still offers a lot of fun despite not being able to die. The amount of platforming puzzles and other physical impediments create a clever game that most 2D platforming purists will enjoy. It is Thursday on our week of new reviews, so that means we've arrived at the fourth review. It is for a handheld version of an ultra-popular and successful series of toys and games. It is Skylanders: Giants for the Nintendo 3DS. The Skylanders series fused two things together, the collectible aspect of buying figurines and video games, to create an addicting and brilliant idea. Combined, they created Skylanders: Spyro's Adventure, and the rest, as they say, is history. It seemingly became a sensation overnight as kids and grown adults (not to hint that there is anything wrong with that) feverishly raided shelves for new figurines for their copies of the game. Now the Skylanders are back, and they have brought powerful Giants with them in Skylanders: Giants. While you may have read a lot about the home console versions of the game, the Nintendo 3DS version hasn't received as much press. 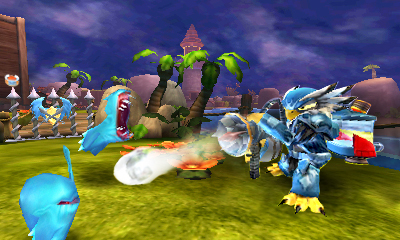 Is the 3DS iteration of Skylanders: Giants a suitable substitute or complement for the console versions? Skylanders: Giants has around 40 new figurines to add to the playing experience. 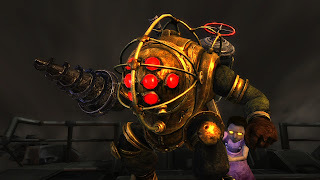 They are brought to life into the game by setting a figure on the Portal of Power and pointing the Nintendo 3DS system's infrared sensor towards the portal. After some waiting the figure comes to life in the video game, able for you to play as them. There are 99 characters in all, some just enhanced versions of existing characters like legendary versions or Series Two versions of Series One Skylanders, and they all have different elements attached to them. Some are water, some fire, some life, some magic, some wind, etc. 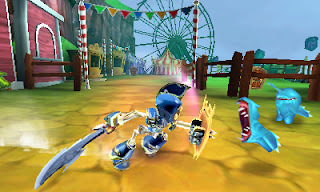 Each Skylander can gain experience levels through collecting coins and beating up baddies. With each level gained comes additional attack strength and health, as well as new or improved moves. bundled in the Starter Pack. 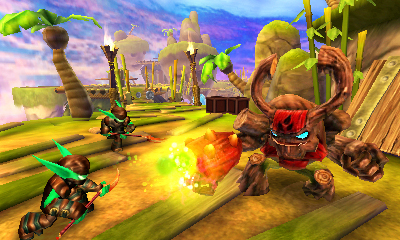 While Skylanders: Giants on the home consoles is a beat 'em up with Gauntlet-esque elements to it, the Nintendo 3DS version is a different beast altogether. While it contains some of the aspects of the home console versions, Skylanders: Giants on the 3DS is a platformer at heart. In fact, the home console versions don't even have the ability to jump while with the 3DS version you'll be leaping across chasms and from platform to platform a lot while defeating foes. The new Giants Skylanders bring on the pain. Each level in Skylanders: Giants has stars you can earn. These are done by performing tasks within each level. You automatically acquire one through completing a given level, but there are also timed challenges, where you must race to the end of the level before time runs out on you, and several mini-missions in the levels. These mini-missions can be activities like obliterating a specific amount of a certain enemy, opening a set number of treasure chests, collecting a certain amount of coins, and clearing elemental gates. Jet Vac cleans up the battlefield. In the game there are various areas that can only be accessed by one type of Skylander, whether it is a giant or an elemental type like fire or wind. These are the aforementioned elemental gates. 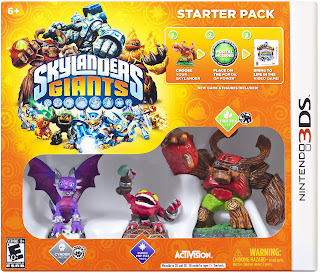 Seeing as the Starter Pack for Skylanders: Giants only contains three Skylander figurines/characters, you need to at least buy figures of a different element to reach the areas that the Starter Pack figures can't gain access to. The elemental gates not only help you gain a star for the level, but they usually have a present at the end of their paths. These presents are different hats that can be worn by your Skylanders, and if you're like me, you'll want to get them all. Oh, the trials and tribulations of being a completionist! With Chop Chop there are no bones about it. One of the major and most noticeable problems with the Nintendo 3DS version of Skylanders: Giants is the recurring bouts of slowdown. It happens way too often and most of the time turns the game into a slide show rather than something consistent. During when you switch Skylanders? Yes. During when you level up? Yes. During when there is more than two enemies on screen at the same time? Yes. 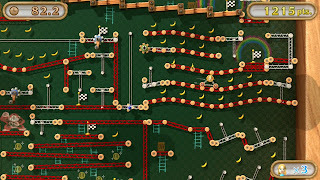 During the level overview where the camera pans around the upcoming level? You probably have caught on to the pattern by now. It is curious as to why the game's performance is so bad when the visuals don't seem to really push the 3DS hardware too terribly hard. Despite the obvious and apparent performance issues that plague the 3DS version of Skylanders: Giants, I still found myself enjoying the game and never really finding myself dying because of slowdown. The platforming is responsive and feels right. 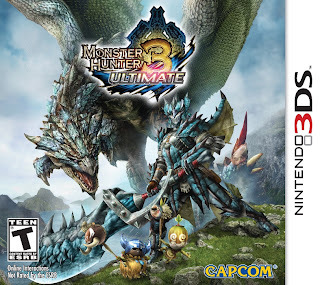 If the performance issues were ironed out, the 3DS version of the game would be my favorite. 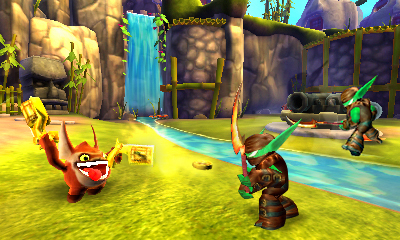 As it is, Skylanders: Giants on the 3DS hardware is one with clear problems but still retains a level of fun that makes it a worthy addition to one's handheld library. Two new combatants will be headed to the PlayStation All-Stars Battle Royale: Kat from Gravity Rush and Emmett Graves from Starhawk. They will available February 12, and for two weeks they will be free to download. Downloadable characters will have their own set of icons, backgrounds, taunts, intros/outros, and victory themes, just like their on-disc counterparts. While you wait for next month, why not check out the two introduction trailers? 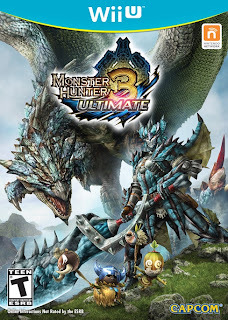 Monster Hunter 3 Ultimate now has a release date other than the vague March time frame. We now know that the game will be releasing in North America on March 19 with Europe's release date to follow a couple of days after. Witness the announcement in this new trailer for the game. We're halfway through this review-filled week. 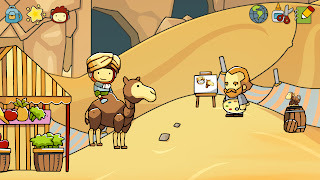 For the third review we have Scribblenauts Unlimited. The copy I reviewed was the Wii U version. 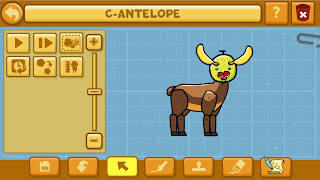 The Scribblenauts series debuted on the Nintendo DS and brought with it highly innovative emergent gameplay and a lot of promise. While the original Scribblenauts did not live up to its potential, its sequel Super Scribblenauts made everyone remember why they were hyped for its predecessor in the first place. Now it is the launch of the Wii U and with it comes the first home console version of the Scribblenauts series, Scribblenauts Unlimited, also on Nintendo 3DS and PC. Does the game offer unlimited potential or limited enjoyment? 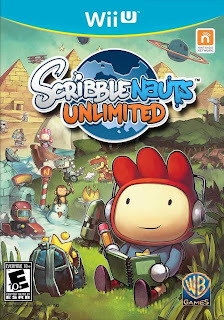 This edition of Scribblenauts tells the tale of how Maxwell got his magical notebook and became the helpful hero fans know him as. 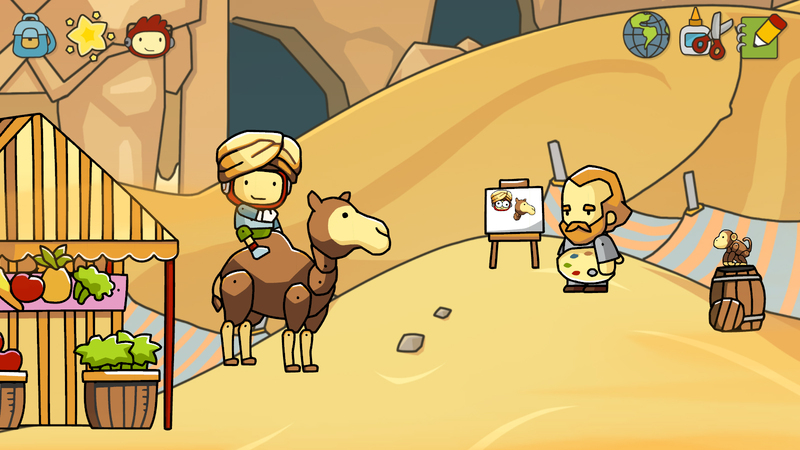 This is how Scribblenauts Unlimited's story goes: Maxwell acquires the notebook and pulls a mean trick on an old man. Turns out the man is a magician who casts a spell that slowly turns Maxwell's sister to stone. It is up to Maxwell to gather special trinkets called Starites to nullify the effects of the old man's spell. The plot is just a means to an end to give an excuse for players to unleash their creativity on the various missions, but it is a nice and simple one nonetheless. Scribblenauts's home console debut has still-frame cutscenes that bookend the game, narrated by Maxwell's sister. So Maxwell has his mission, but how does he collect Starites? Well, there are a multitude of levels to enter, each with their own set of characters, objects, and whatnot that need the type of help that only Maxwell and his magic notebook can provide. 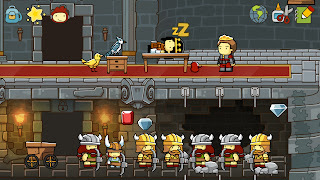 The notebook is the most important piece to Scribblenauts Unlimited. You can input a noun and it will mystically pop up in the game world. There are limits to what you can place, but for the most part, there is a wide range of words that the game recognizes. In addition to nouns, you can add adjectives to objects and characters to make them even more unique. For example, you can write "giant" and a huge male character will be summoned. Then you can add a "green" adjective to him and he will change color. If things get too hot, why not write in some rain? What does this have to do with the actual people needing help? By summoning the right object or using the right adjective, you assist the various cries for help and are awarded Starite shards. Such an instance could be a zombie who is hungry. Type in "brain" and you will satisfy the zombie's hunger and be awarded with a shard. 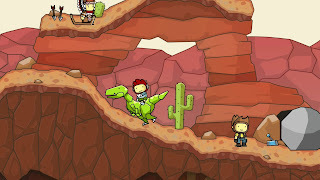 The fun of Scribblenauts Unlimited is knowing that you can complete missions in a vast array of ways. There is no "one" solution in most cases. If you have gorilla sitting on top of a building with the clue of "King me", you can opt to give the gorilla a crown for the simplest solution, or you can opt to input "chessboard" and voila, the gorilla is satisfied that way as well! It is absolutely fun to concoct different solutions each time you play. Though, occasionally something that you would think would work doesn't, and that just creates a little frustration. 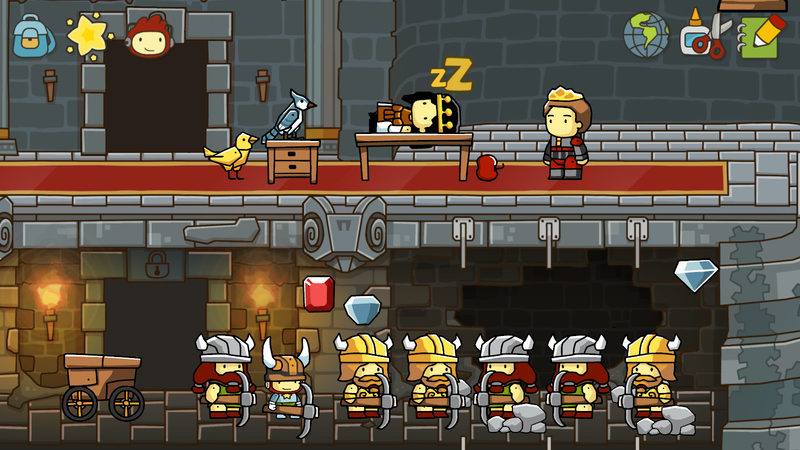 Even a crew of vikings needs a little bit of "me time." Nonetheless, even if you mess up entirely and somehow kill an important character you can always reset a given level. The Starites and Starite shards you earned will stay collected, but everyone and everything in the level will return to how it was originally when Maxwell first stepped into it. In addition to the individual characters and objects needing help, there are special missions.. These require multiple steps to solve them, but the reward is much greater, a full Starite. Such examples include helping a boy scout earn his badges, breaking out of a booby trap-filled prison, or assisting a chef in cooking something fabulous. As you gain more complete Starites, the areas of the world map that you can explore increases, but Maxwell's sister becomes more petrified in the process. Riding a raptor? Why the heck not? 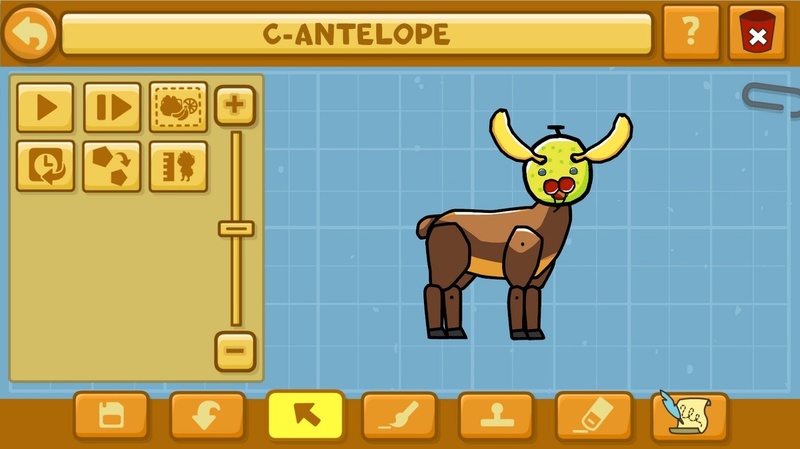 Something not in the Nintendo 3DS version of Scribblenauts Unlimited is the object editor. Here you can tinker with preexisting objects or build your own. These objects can be shared with other users online via a marketplace-like setting. Already there are brilliant designs manufactured, a lot of them video game-related objects such as Sonic the Hedgehog and Metroid's Samus Aran, for instance. And don't worry about not having enough space as you can hold upwards of 500 saved objects. and the deer and the c-antelope play. 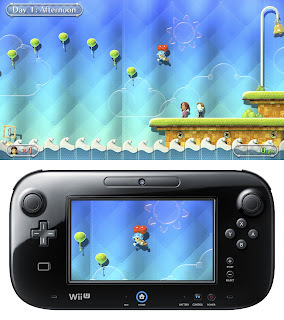 Scribblenauts Unlimited looks fantastic on the Wii U. The higher definition than what was possible on the Nintendo DS offers crisper and cleaner characters and absolutely vivid levels. Since the game is on more powerful hardware, the limit of how many objects you can create on screen at the same time has greatly been improved. Obviously this isn't the case with the Nintendo 3DS version, which can easily be considered the weakest of the three (Wii U, 3DS, and PC). The ability to play Scribblenauts Unlimited on the Wii U GamePad exclusively is also a wonderful feature of that version. Meanwhile, the music is quite catchy and even got me bopping my head while I was playing. 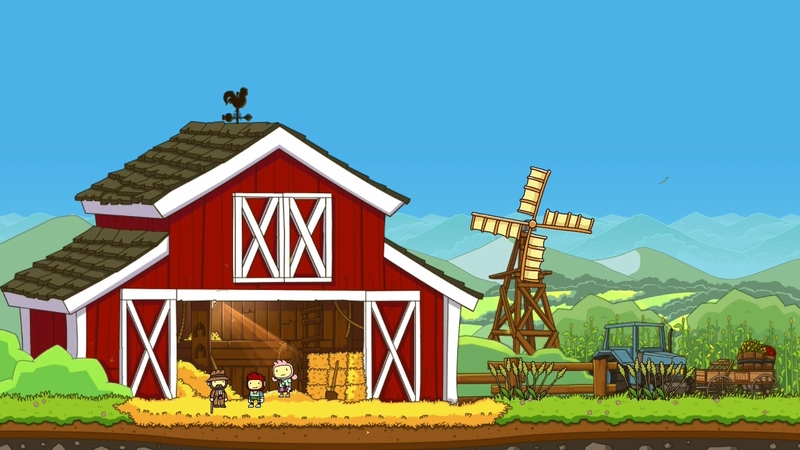 Overall, Scribblenauts Unlimited is a success when it concerns presentation. 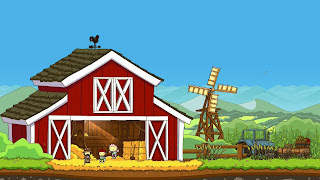 The home console debut of Scribblenauts is very much a noteworthy one. 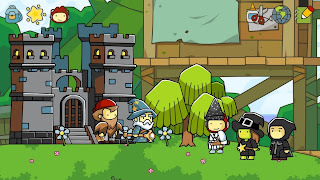 While there are the occasional glitches like failing a mission because Maxwell died mysteriously or objects falling through the ground, the good far outweighs the bad in Scribblenauts Unlimited. The possibilities for solving puzzles and helping people are very high. The only limitation is your imagination... and the game sometimes not being as open-minded with solutions as it is advertised as. The second in our series of reviews for this week is PlayStation All-Stars Battle Royale. Now, you can sit around arguing that this game is a ripoff of Nintendo's Super Smash Bros. series till the cows come home (I don't know who even uses that saying anymore), but while you do that, I'm sure millions like myself will be enjoying the game. This isn't mentioned in the review body, but if you buy the PlayStation 3 version of Battle Royale, you get a code for the Vita version. While we're on the subject of versions, this review is based off the PlayStation 3 copy of the game. 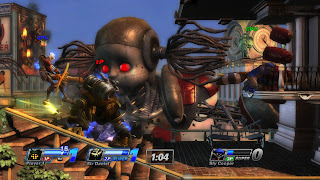 Read anything on SuperBot Entertainment's PlayStation All-Stars Battle Royale and you are certain to see the words "Super Smash Bros." pop up somewhere within the sea of words. For a brand that has lasted almost two decades now, it is about time that PlayStation got its own all-stars game. 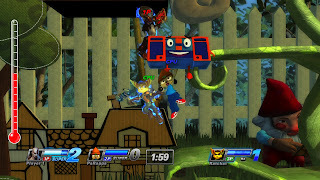 While the similarities to Nintendo's Super Smash Bros. are indeed prevalent, PlayStation All-Stars Battle Royale certainly does enough to distinguish itself from the series whose shadow it has stood in since its announcement. 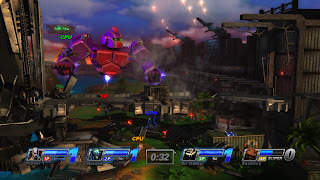 The roster of PlayStation all-stars isn't as star-studded as Nintendo's lineup, obviously, but given what they had to work with, SuperBot delivered a competent catalog of characters nonetheless. Sure, having third-party characters like BioShock's Big Daddy don't make much sense (BioShock started on the Xbox 360, after all), and the addition of an evil version of Cole MacGrath is a waste of a character slot, but most of the choices are smart. You have your old-school PlayStation characters such as Spike of Ape Escape fame, Sir Daniel Fortesque from MediEvil, Twisted Metal's Sweet Tooth, and PaRappa the Rapper, as well as PlayStation 2 era mascots like Kratos, Ratchet & Clank, Jak & Daxter, and Sly Cooper. Finally, the current PlayStation era gets much representation with Nathan Drake (Uncharted), Nariko (Heavenly Sword), Radec (Killzone), Cole MacGrath (Infamous), and Sackboy (LittleBigPlanet). to drop some helpful beats. 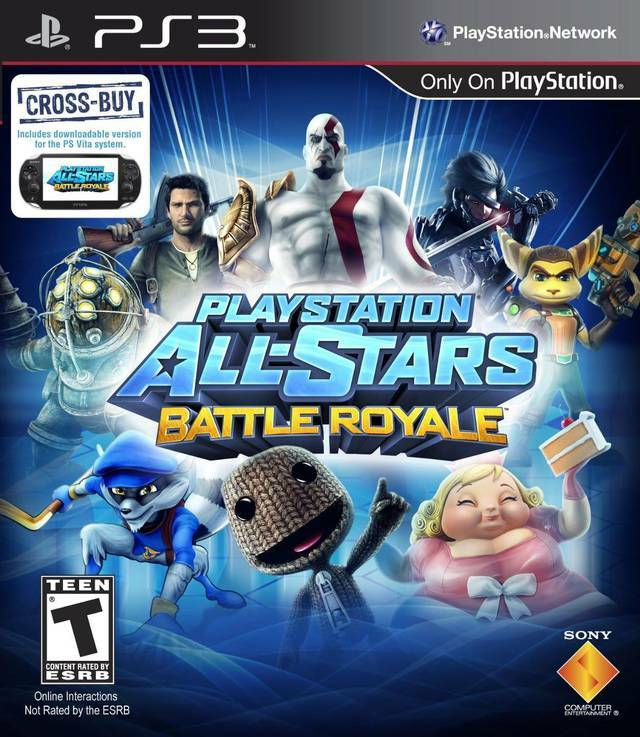 As stated with BioShock's Big Daddy, in addition to the first-party lineup of famous video game characters, PlayStation All-Stars Battle Royale contains several third-party selections. You have your pick of Dante (Devil May Cry), Raiden (Metal Gear Rising: Revengeance), and Heihachi (Tekken). The promise of downloadable characters, the first batch of which comes out early this year, means the lineup is only going to get bigger and better. Mr. Bubbles would like to play. To go along with the characters, there are all of the stages for these all-star brawls to manifest themselves in. Instead of just going with one franchise per arena, SuperBot has made it so as many series as possible can be represented across the 14 stages. These "mash-ups" take the unlikeliest of franchises and mushes them together to sometimes hilarious results. 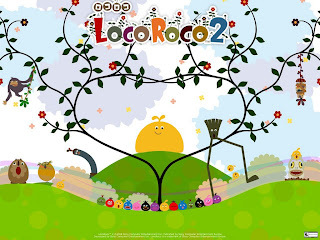 Having a fight in the pleasant and colorful world of LocoRoco when all of a sudden the background shatters to reveal a Metal Gear and dilapidated city landscape makes for some interesting eye candy. Couple that with environmental hazards like in the Sandover Village stage where characters from Hot Shots Golf tee off from the background and pelt the battlefield with golf balls, and you have some splendid wackiness. If it's too wacky for you, you can turn off all hazards for strictly fighting-based battles. series and the God of War series. Battle Royale plays like a more advanced Super Smash Bros. in the control department. Instead of only having one button and a stick direction for a given attack, Battle Royale has three buttons, and depending on which way you're holding the stick (up, down, left or right), a different attack with be delivered. Square is used for weak attacks, Circle for medium, and Triangle for the heavy variety. 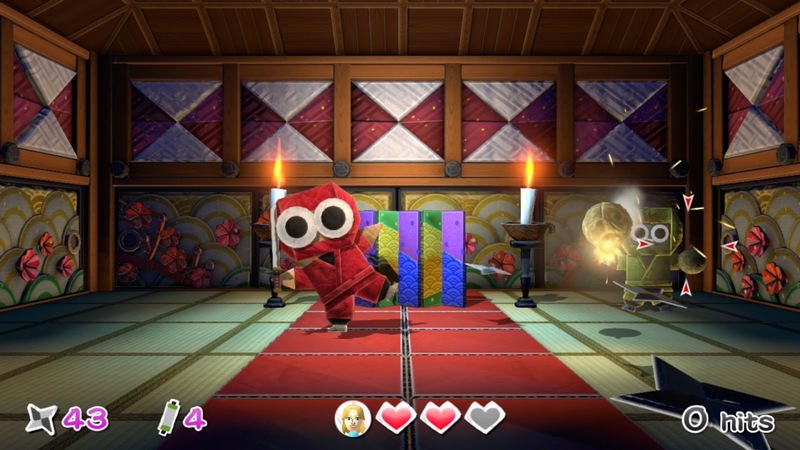 Each character in the game has a wide array of ways to bring the pain onto his or her opponent(s), taking many pages out of the exact moves they have in the games they are from. Ratchet has his barrel loaded and ready to fire. As you beat down your opponents, you fill up your AP gauge.When it is full, your character can unleash a Super Attack. Each character has three different Supers that they can use: a Level One, a Level Two, or a Level Three. A Level Three means they need to fill up the AP gauge three times without doing a Super. Unlike Level One Supers, Level Threes are essentially guarantees that you will at least get one kill. They last longer, and they are much harder to avoid than Level One Supers, which don't have much in the way of reach, and Level Two Supers, which while a step up from a Level One, still don't guarantee kills. Unlike other party fighters, Supers are the only way to get kills in PlayStation All-Stars Battle Royale. That means strategically using a Super through using it at the right time is crucial for victory. You can try to build up a Level Three, but you risk taking too much time doing so. Perhaps you go for a quick Level One Super kill, but that can be dodged rather easily in most cases. This area of strategy is one that I am particularly fond of. While it isn't as fun as Smash Bros. (sorry for bring that series up again), Battle Royale's setup is still a blast. favorite stages in Battle Royale. There are several modes for solo players without an Internet connection, but obviously the real joy is in hopping online and participating in all-star bouts against the world. More on that later. Arcade Mode is the primary source of entertainment for solo players. You take one of the 20 characters through a series of matches. It starts off slow with a one-on-one timed contest, then you are thrust into combat with two other fighters, then three, and then you face your character's rival before taking on the final boss. While it is true that Arcade Mode is a bit bare-bones, I did find myself enjoying going through it with each character, watching the multiple image intros and outros that bookend the playing, and obtain valuable experience in the process. Along with Arcade Mode, there are various character-specific trials and tutorials to try out to gain experience that way as well. Speaking of which, gaining experience is something that keeps me hooked to Battle Royale long after I acquired all of the trophies (it is relatively easy to do so, all trophy hunters). Each match completed, whether win or lose, awards whatever character you currently are with experience. As you gain levels you earn new content specific to your character, such as icons, backgrounds, taunts, victory themes, and even an alternate costume at Level 10. With the ability to level up in the hundreds, you'll be playing as your mains for a grand time. 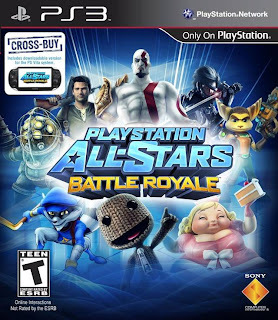 But no doubt the main reason that many would be interested in PlayStation All-Stars Battle Royale are the online and local multiplayer bouts that keep everyone up till the break of dawn. Battle Royale delivers in this regard splendidly with mostly lag-free matches online, either ranked, public, or private; free-for-all or team-based; hazards and/or items off or on. My only main gripe with the online experience is that I did encounter some freezing in between matches that forced me to have to hard reset my PS3 system. Nothing too major or damaging, but annoying nonetheless. Sony's party fighter is certainly fast and fluid. There is seldom any signs of intentional slowdown, even with all of the things happening on the screen. However, by that same token, it can be troublesome to see where your character is on the screen, especially with the occasional camera problem of it not showing the entire battlefield. On the sound side, SuperBot Entertainment and its cohorts have done a fantastic job of remixing music, including original music and voice actors, and creating some nice sound effects in the process. Perhaps it's not the smoothest sailing ship in the fleet, but Battle Royale does not tread a lot of water in the presentation department. away to see the action. 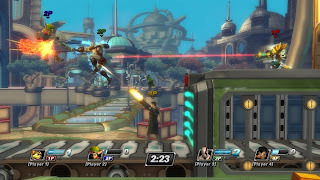 PlayStation All-Stars Battle Royale does not quite outshine its main competitor in the market, the Super Smash Bros. series, but at the same time it does not have the qualities of a ripoff either. The game does more than enough to separate itself from Smash and make for a tremendous party fighter. PlayStation fans now have a game to rally around and call their own, and one they can be proud to play and enjoy. The way Supers work might detach some players from the Battle Royale experience, but I found it to be a welcomed change to the standard formula-- again, setting it apart from other games of the party fighter genre. Gather your friends, whether online or off, and get ready for a Sony-style brawl to end them all. The much-rumored Disney Infinity has finally been revealed, and with it came a terrific trailer. It is figurine-based a la Skylanders, but with its own Disney-filled charm. Expect Disney Infinity out (at least according to this trailer) in June of this year for most major platforms. We have arrived at the first review of the new year (and the first review of this week of five reviews), and boy, is it a big one. 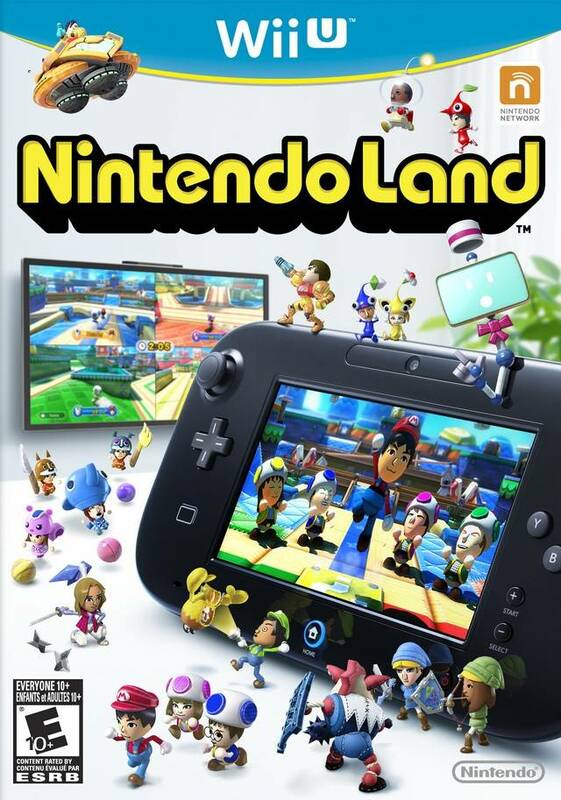 Nintendo Land launched with the Wii U, and it contains 12 attractions, each with their own gameplay mechanics. Is this the launch title to talk about for the Wii U lineup? The Wii U is finally here, and the system leads off with a premier game that hopes to show off the potential and various uses of the all-new Wii U GamePad controller. The game is none other than Nintendo Land. Like Wii Sports before it, Nintendo Land is supposed to give a good idea of what kinds of innovation the Wii U GamePad brings to gaming. Does Nintendo Land succeed or is the sixty dollar price for admission not worth the money? Nintendo Land features twelve unique attractions, all based off of Nintendo properties such as Mario, Metroid, and The Legend of Zelda. Six of the attractions are made for multiplayer (three of these have modes that can be played solo) while six are exclusively single-player affairs. The Nintendo Land hub is known as the plaza where Miis from around the world congregate pending the player's approval to allow other Miis to show up. A giant tower rests in the center where you can spend coins earned simply by playing attractions to play a pachinko-like mini-game. The goal of the mini-game is to drop coins inside slots to light them all up. Each time this feat is performed, you earn a prize that sits around the Nintendo Land Plaza. These prizes come in the form of question blocks a la Super Mario Bros. and are opened by simply walking up to them or touching them with the GamePad screen. All prizes are based off one of the twelve attractions, and there are 200 total. There's even a jukebox that plays music from the various attractions, so you can listen to songs from The Legend of Zelda: Battle Quest or Metroid Blast, for example, at any time as you stroll around the plaza. Like Wii Sports and Wii Sports Resort before it, each mode of each attraction in Nintendo Land can earn a player up to five stamps. Think of these as achievements for a given attraction's mode. These can consist of goals like mastering all missions in Metroid Blast, visiting all islands in Balloon Trip Breeze, or making your first successful jump in Captain Falcon's Twister Race. I would now like to get into the actual attractions themselves. I'm going to start with the team attractions, then go to the competitive, and finally wrap up with the solo attractions. Team attractions, of which there are three, have the most in the way of modes. These can be played in solo fashion or with other players. This attraction that is based off of one of Nintendo's most heralded franchises plays as an on-rails adventure. It can be played with up to four players. One person uses the GamePad to launch arrows at faraway enemies while the others use the Wii Remote Plus to slice and dice foes with their swords. The GamePad player uses the right stick to fire off arrows, holding down the stick to charge their shots. These charged shots will break through an enemy's wooden shield instantly and take down a foe's health by a considerable amount. The person using the GamePad can look around and aim with the controller's gyro sensors and reload by pointing the GamePad downward. Dodging is performed by pressing in both the ZL and ZR buttons or by tilting the controller-- but only when prompted. Meanwhile, the Wii Remote Plus players act out Skyward Sword by swinging the controller and slashing baddies. Depending on how they swing the remote, their Mii will swing its sword in a specific direction. When it concerns enemies with shields, the swordsman needs to swing their sword from the right angle or else they will hit the enemy's shield, stunning them and leaving them vulnerable for attack. The swordsman can also hold out their own shield to deflect attacks and arrows from enemies. 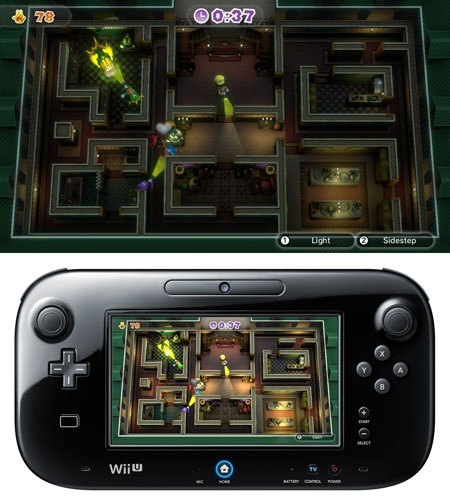 The Legend of Zelda: Battle Quest has nine starting levels to progress through. The goal is to reach the end of each stage, beat the boss, and collect the Triforce. In the way are hordes of enemies, simple switch-hitting puzzles-- some of which are timed, and the aforementioned bosses. When playing solo, you can opt to use the GamePad to be the archer or use a remote to be a swordsman. However, when playing on a team, all players share a stock of six hearts. Each time any member gets hurt, a heart disappears. If all hearts are gone, it is game over. Thankfully there are opportunities to recover hearts, usually by defeating a fat bird that flies around in given parts of each level. Battle Quest delivers a Legend of Zelda-like experience that whether it's alone or with other players demands practice and patience. It is difficult to get through all of the levels, and even more so trying to master them (i.e. not take any damage). Another cooperative attraction, Pikmin Adventure puts you into the shoes of Captain Olimar with the task of getting through dozens of levels to escape the planet. However, you are not alone in your earthly journey. A band of Pikmin friends join you. 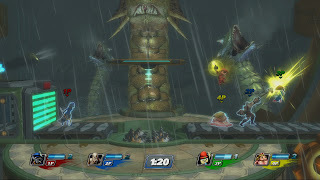 You control Captain Olimar with the analog stick and tap areas of the touch screen to toss Pikmin onto foes, and to break boxes containing Pikmin-strengthening nectar and other helpful items. 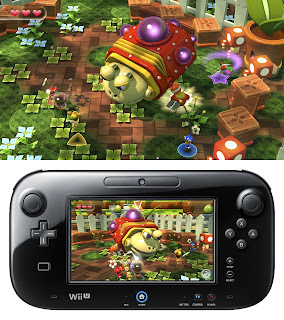 In a multiplayer setting, the GamePad player is Olimar while the Wii Remote players (with the remote held like an NES controller) serve as larger than usual Mii Pikmin. Nonetheless, like The Legend of Zelda: Battle Quest, all players share the same life bar, meaning that one bad player can ruin it for everybody. Pikmin Adventure starts off very easy, perhaps deceptively so. Once you reach the later stages, you will find yourself overwhelmed with enemies and not given a lot of room to work with. Bosses become much more challenging as well. To master levels, you need to beat a given mission under a certain time without taking any damage. The final team attraction, and perhaps my favorite of all of the twelve Nintendo Land attractions, is Metroid Blast. You can take control of piloting Samus's fabled Gunship or taking the fight on foot. 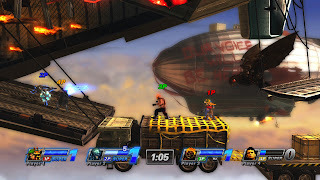 The Gunship player uses the GamePad to move around with the left stick, rise and fall with the right stick, look around with the gyro controls, and fire at foes with the RZ button. This control scheme definitely takes some getting used to, but when it is mastered, it feels really right. On the other side of the equation is/are the on-foot player(s). This is the only attraction to utilize the Wii Remote Plus Nunchuk. This is used for movement. Holding the A button on the Wii Remote allows you to look around as you blast targets. The main mode of Metroid Blast consists of thirty missions, ten of which are extra after the initial twenty are completed. These range from defeating all enemies, collecting all of the Mii token spread around a given arena, or beating a boss such as Kraid or Ridley. 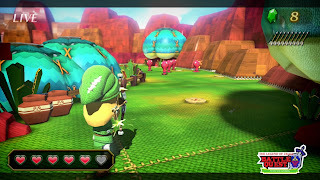 The extra missions are some of the most difficult diversions players will experience in Nintendo Land altogether, but they are certainly rewarding when they are completed. Two other modes await players in Metroid Blast, and they are both versus excursions. One has a Gunship player taking on the on-foot player(s) while the other has everyone on equal footing (literally) in a ground combat battle to collect the most tokens. Metroid Blast is a feature-rich action-packed attraction that will delight players with its fast and frenetic firefights and fast-paced encounters. As I stated earlier, it is definitely my favorite of the twelve Nintendo Land attractions. These attractions are what make Nintendo Land so fantastic in the multiplayer department-- not to say the attractions I've already talked about aren't. Regardless, these are the ones that require cooperation between teammates. These are also the ones that are shining examples of the asymmetric gameplay that Nintendo has been touting so much over the past year or so. My favorite of the competitive attractions is Mario Chase. The GamePad player, dressed as Mario, is the person being chased while the Wii Remote players, dressed as Toads, are the ones pursuing, hoping to catch him. 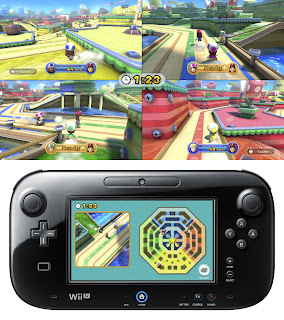 At the beginning of each game, the GamePad player gets ten seconds to create some distance between himself and the Toad players. Although he is outnumbered, the GamePad player has the luxury of seeing an overhead view of the playing field on the controller's screen to plan his escape route if things get heated. If the player can last two minutes without being caught by a Toad, he wins. If a Toad tackles or tags the Mario character, they win. If Mario Chase is only played by two players, one as Mario and one as the Toad, the Toad player gets two AI controlled Yoshi carts that patrol the map. If they see the Mario player, their flags will go up and the computer will tell the Toad player what colored area of the map the Mario Mii is located. If a Yoshi cart gets close enough to Mario, it will lash out its tongue, temporarily stunning him. Additionally, the Toad player also gets the bonus of having a counter on the bottom of the television screen to say how far away his target is. Even when played this way, Mario Chase is a bundle of awesome fun. The panic that sets in on the Mario player when a Toad approaches him or her is hilarious. The "D'oh, I almost had him" reaction from Toad players when they just miss nabbing Mario is also guffaw-worthy. 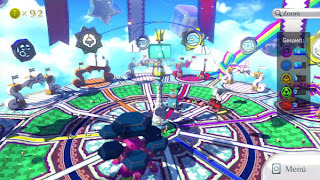 All-in-all, Mario Chase is simply sensational and an excellent party attraction. The second competitive attraction is Luigi's Ghost Mansion, a fright-filled spooktacular game. The goal of this game is for the Wii Remote players (up to four people) to shine their flashlights on the invisible GamePad player, acting as the ghost, in order to drain its life and defeat it before the ghost player can defeat the remote players. Despite being invisible to players, the ghost can be seen if it dashes or a flash of lightning illuminates the playing field. 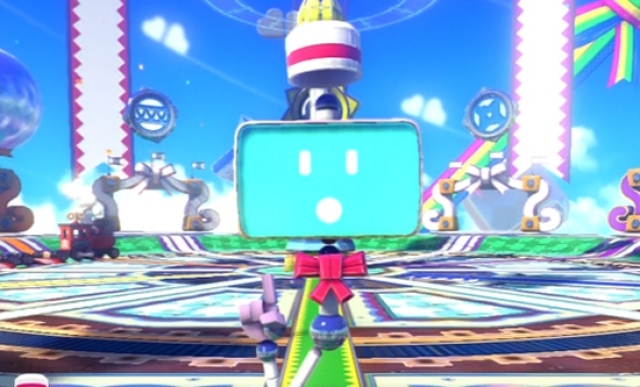 The players' Wii Remotes also vibrate when the ghost is near them. The Wii Remote players can't just use their flashlights all willy-nilly either. If they do, they'll find themselves without power and ripe for the taking by the ghost player. Luigi's Ghost Mansion is a tense attraction for all parties involved. Even when it's just two players going at it (in this case there are invincible computer-controlled characters that flash their lights), the game is still entertaining and worthy of gaming sessions that last far into the night. The Animal Crossing attraction has up to four players trying to gather a certain quota of candy before they are tackled by the GamePad player three times. The more candy the players hold at once, the slower their movement speed. There is a strategy to unloading candy just so you can move faster and make a clean getaway. The Wii U GamePad player controls Copper and Booker, two guards. One is moved with the left analog stick while the second is moved with the right analog stick. As the GamePad player you can't just spread the guards out. You need to have them work as a team to corner the candy-collectors and tackle them. 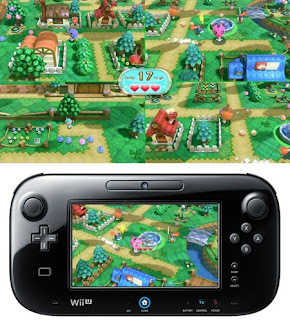 Unfortunately, there are only two maps for Animal Crossing: Sweet Day. That said, however, this attraction is a tremendous bunch of fun that with many players is just absolute marvelous madness. If you're all alone and your get-together isn't until Friday, why not try out the solo attractions of Nintendo Land? Although these require but one player, a second person with a Wii Remote can assist in certain sections of each attraction. For instance, in Yoshi's Fruit Cart, the Wii Remote user can eat one fruit for you each level to help out. This is called the Assisted Play function. Also, unlike the team and competitive attractions, you can earn trophies based on how many points you earn, from bronze to platinum. Yoshi gets his own attraction with Yoshi's Fruit Cart. The objective of this game is to lead Yoshi to collect all of the fruit on the screen and guide him to the goal gate. This is done by drawing a path on the Wii U GamePad. However, the catch is that the fruit only shows up on the television screen, meaning you need to reference various points in the background of each level in order to draw the trail on the controller's screen. At first the challenge is really low-- fruit sit by easy reference points. As you progress through the attraction, fruit begin moving, you have to eat fruit in a certain order, the background is less helpful, and dangerous obstacles like bees and holes are introduced. Yoshi's Fruit Cart may be simple in design and aesthetic, but it is a good helping of enjoyment. There are over 50 levels in all, and reaching the end gives you a grand feeling. Ready for a challenge? Well that is exactly what you'll receive with Donkey Kong's Crash Course. The idea of this attraction is to tilt the GamePad to move a vehicle through an obstacle course. This is easier said than done as the egg that represents your Mii that sits on top of the vehicle can break without much force. It's a breeze to accidentally go too fast or go too slow and make a mistake. Many times you need to tilt the GamePad all the way in one direction to cross a chasm and then quickly tilt back to regain control before your vehicle slams into a wall or girder. Also, the shoulder buttons are used in the attraction to control certain pathways and elevators. 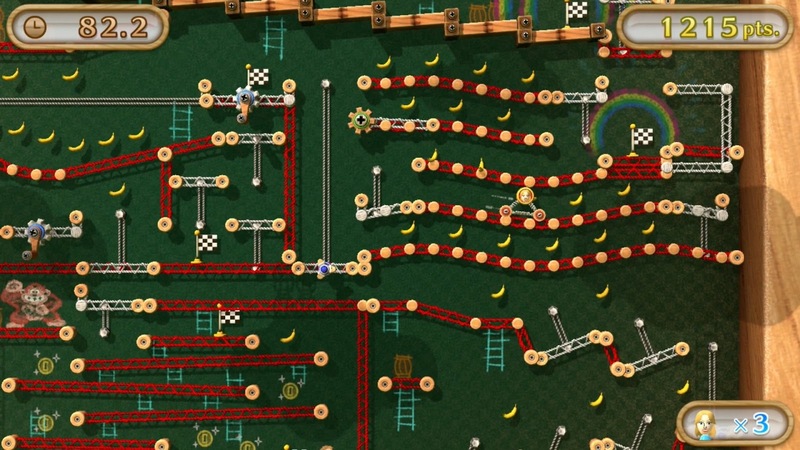 Despite the immense challenge of this attraction, Donkey Kong's Crash Course always seems fair. There are a total of four different courses in this attraction, and if you can make it to and save Pauline for the fourth and final time, you are indeed an expert at manipulation... well, trolley manipulation, that is. Takamaru's Ninja Castle is based off of a Japan-only Famicom Disk System game. The attraction itself consists of four stages where the goal is to hold the GamePad vertically and swipe one's fingers across the touch screen to throw shuriken at enemies and to deflect attacks. Pending on the angle of the GamePad, the trajectory of your throws will change. As you progress you earn ninja scrolls that allow you to draw a symbol on the touch screen with your finger to unleash a special move, such as Falcon Eye that grants you five seconds to fling a profusion of shuriken at slowed down opponents. Takamaru's Ninja Castle is an enjoyable game that tests your reflexes and aiming skill. It's most likely my favorite of the solo attractions because I can return to it time and time again to hone my throwing star ability. 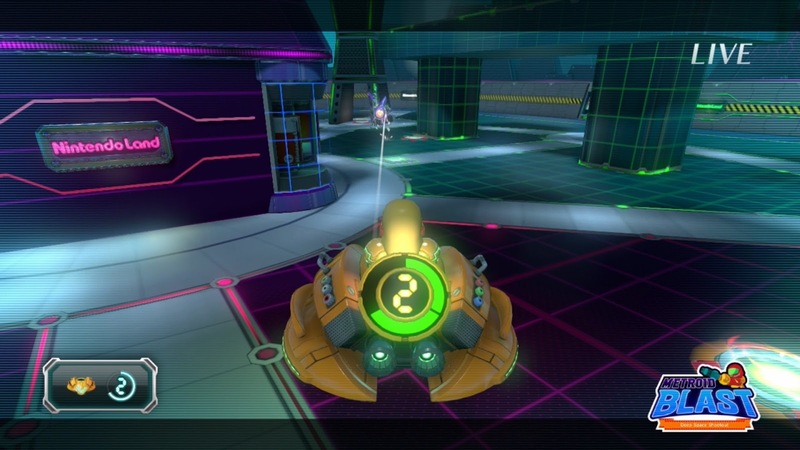 Based on the futuristic racer F-Zero, Captain Falcon's Twister Race has you holding the Wii U GamePad vertically and steering your Blue Falcon-riding Mii through the track with the controller's gyroscope. The television screen shows a behind-the-back view of your Mii, typical of standard racing games, while the GamePad screen is an aerial view that allows you to see more of the track ahead. There are 12 different sections of the track, and each section is timed. If you don't reach a checkpoint in time, fall off the track, or hit a bomb, it is game over. 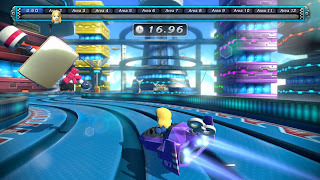 Captain Falcon's Twister Race requires a lot of finesse to accurately steer your vehicle through the numerous obstacle-laden sections of the track. However, it is a wild ride and an engaging one at that, too. Swiping the touch screen to generate gusts of wind for your Mii character to be pushed from is the name of Balloon Trip Breeze's game. This attraction is an auto-scrolling affair that moves from right to left. Not only do you want to pop balloons that give you points, but you have to dodge static and moving mines as well as bird baddies. 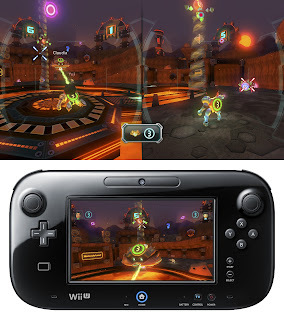 While the television screen grants you a full-sized view of the playing field, the GamePad screen has a zoomed-in view. I found myself not even using the GamePad screen and focusing entirely on my TV, which I can certainly guess wasn't Nintendo's hope. 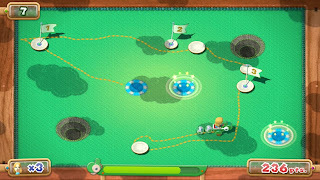 Balloon Trip Breeze is made up of three days, but after completing the initial three, you unlock more that essentially doubles the content and the challenge the next time you play the attraction. The attraction as a whole is a pleasant experience that I didn't mind playing through time and time again despite thinking the two screens were worthless for this particular activity. Lastly comes Octopus Dance, based off a Game & Watch game. This attraction-- my least favorite of the bunch-- is a rhythm-centric one where memorization is key. The diver dance instructor performs three movements. You must repeat those movements with the analog sticks or the gyro sensor of the GamePad in time with the beats. As you reach the end of each round, the movements grow faster and faster. 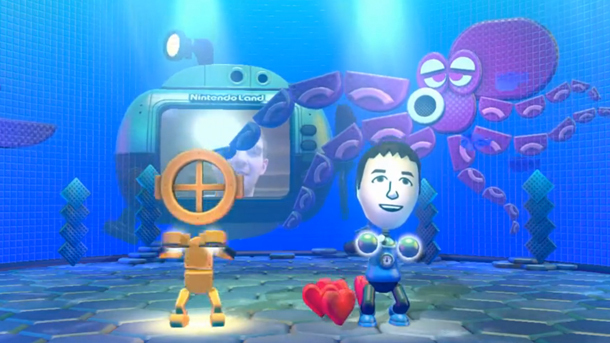 The use of the GamePad on Octopus Dance, outside of movement, is to get a backside view of both you and your instructor. You see, the movements you must memorize and repeat involve directions. If the instructor uses his left hand, you must do the same, so looking at the right screen is crucial to getting each movement right. After each round, the instructor will turn you around, making it so you need to divert your eyes from the GamePad screen to the television screen. Additionally, sometimes your screen will get doused in ink by an octopus, so you must look at the other screen. This becomes even more crazy because you are looking at the front of your Mii and instructor, meaning you must mirror the instructor's moves. Considering how fast these movements occur in later rounds, this can be like rubbing your head while patting your stomach. Octopus Dance is just incredibly difficult, and it's an attraction that I found more cheap than a real actual challenge. 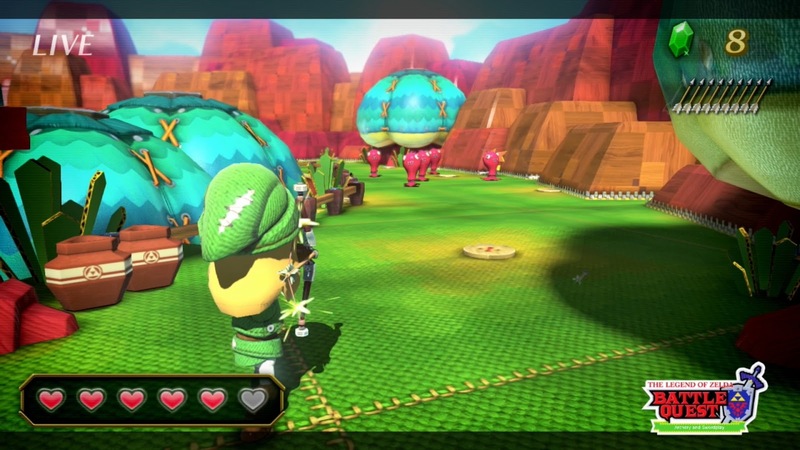 Nintendo Land's presentation is full of vibrant color. Everything, whether boss, enemy, vehicle, or piece of background, is made to look like a toy. 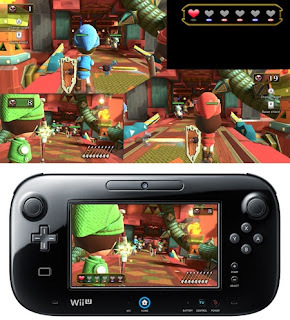 For example, Ridley in Metroid Blast has various parts connected by bolts while the plant-life in Pikmin Adventure are made of cloth, quilt, and other similar fibers. Nintendo Land really has the sensation that you're playing Nintendo properties in an amusement park setting with one cohesive toy-like feeling to them. In addition to that comes the sound. Your guide through the park is a robot with a monitor for a face named Monita. She has a monotone female voice that explains the ins and outs of the numerous attractions and particulars about the game as a whole. The actual music of each attraction is fantastic. There are remarkable remixes of several familiar Nintendo tunes such as Super Mario 64's Slider, The Legend of Zelda: Ocarina of Time's Gerudo Valley, and Animal Crossing: City Folk's city theme, and these remixed themes can be heard at any time in the Nintendo Land Plaza, pending you have won them as prizes. Overall, the entire presentation of Nintendo Land impresses. Nintendo Land might not be the real life theme park many fans have been clamoring for, but this is a stellar compromise. The majority of the attractions are great fun, but many of them require multiple players to really shine and be greatly entertaining. If you do not have anyone else to play Nintendo Land with, this game is probably not for you. The solo parts of the game can only go so far. However, if you do have people to play with, then Nintendo Land will make party night and any other get-together all the more enjoyable. Just remember to please party responsibly. Can you believe we're already approaching the 300th VGM? I wonder what it will be. No, seriously. I have no idea what song I want to choose for it. Anyway, I'm getting ahead of myself. Today we have five more VGMs to listen to, including music from Super Mario Galaxy, Chrono Cross, and Final Fantasy VII! 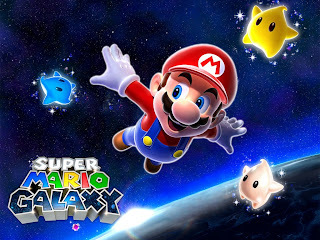 Floater Land is not a theme that is heard a lot in the original Super Mario Galaxy. If memory serves me correctly, it only appears in the Buoy Base Galaxy, which only has two Power Stars to collect. That's a shame, too, because Floater Land is one of my favorite themes from the game with its outer space feel and big brass. Arni Village is the hometown of the main character of Chrono Cross. However, Another Arni Village is a place in another world. The theme for the town is quite beautiful with piano and guitar sharing time in the spotlight. 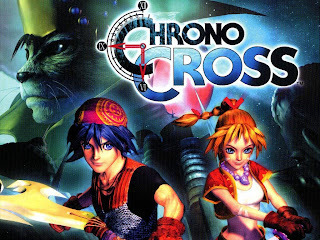 Yasunori Mitsuda really amazed his work on the Chrono Cross soundtrack, and this theme is just one small testament as to why. 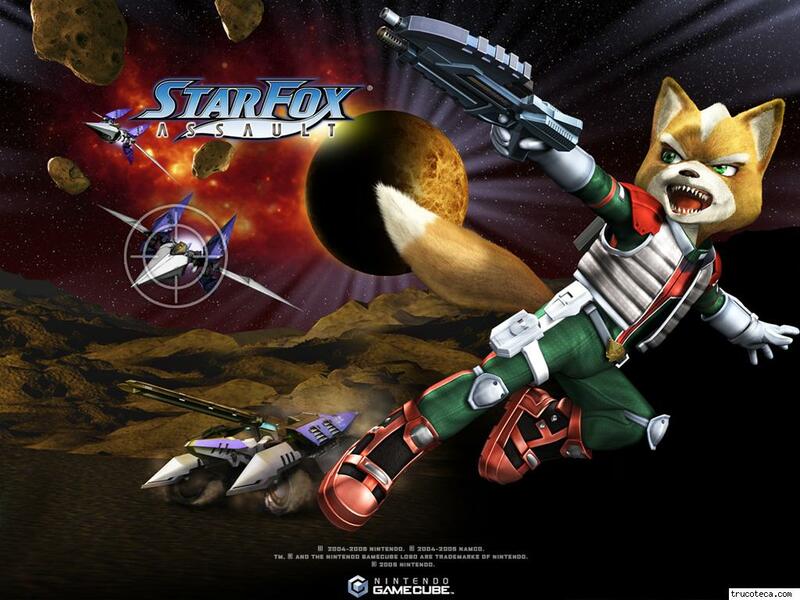 Star Wolf debuted in the tremendous Star Fox 64. They returned in the GameCube's Star Fox Assault, and this time around they had a fully orchestrated version of their theme to blare during their appearances. I cannot get enough of the trumpet in this version of the piece. On the whole, the Star Fox Assault soundtrack is one of the GameCube's absolute best. We've previously listened to a track entitled "buibui", so now we listen to a track called "muimui." The piano leads off followed by some Alvin and the Chipmunks-esque singing. 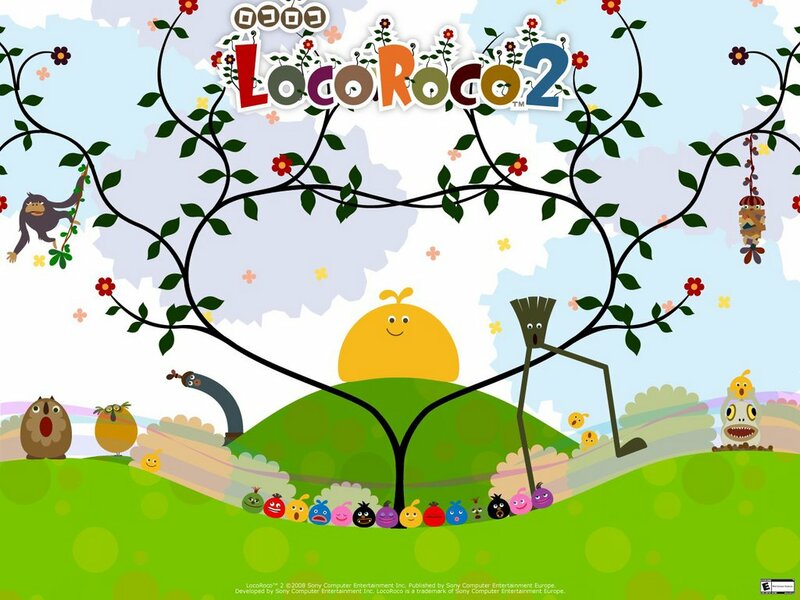 The theme is insanely catchy and perfectly fitting for the cute world of LocoRoco. One of the most lovely character themes of Final Fantasy VII comes from a character that is easy to miss, a secret character, if you will. Descendant of Shinobi is the theme of Yuffie. Her song is quite folksy with a peppy beat to it. Although I'll always love Final Fantasy VI's soundtrack the best, you can't argue that Final Fantasy VII's music isn't great. Next week we will be witnessing the 300th VGM. Until that time, why not check out all VGMs prior to that one with my VGM database?